When planning a project it is important to learn about the internal and external factors that can affect the project. There are some excellent strategic planning methods that you can use analyze all these factors. SWOT analysis and PEST analysis are two of the most frequently used planning methods. 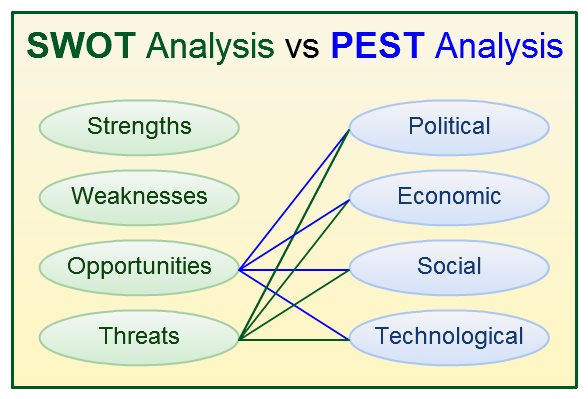 Below is a brief introduction to both methods and a comparison of SWOT analysis and PEST analysis. Strengths – The advantages you have over the competition concerning this project. Weaknesses – The disadvantages you have internally compared with your competitors. Opportunities – Current external trends which are waiting to be taken advantage of. Threats – External movements which may cause a problem and have a negative impact on your business. Sometimes SWOT is referred to as SLOT, where weaknesses are names as liabilities. By working through each of these points it is possible to identify any internal disadvantages or advantages which could benefit or hinder the outcome of a planned project. In addition to evaluating the state internally, this method is also able to identify the external factors which could also make a difference to the success or failure of a project. You can easily create SWOT diagrams using our diagramming tool. 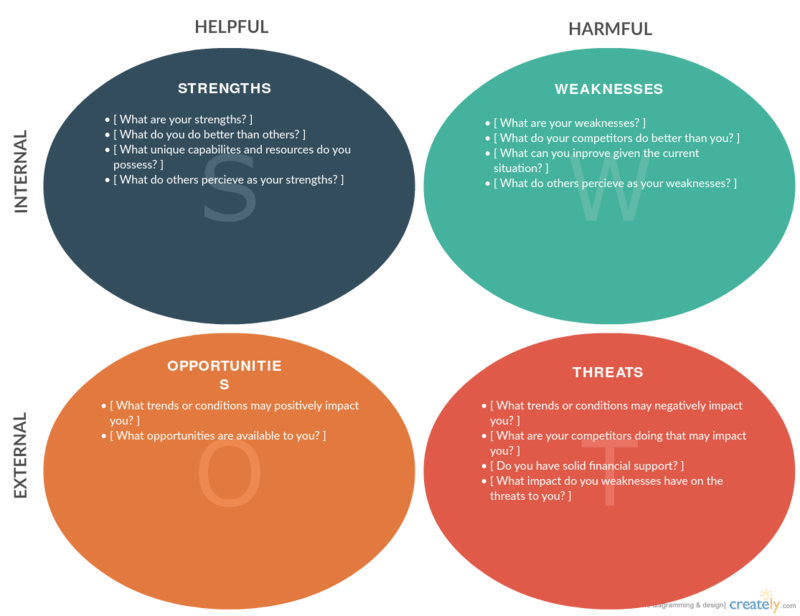 Or you can use our SWOT analysis templates to get started instantly. By knowing this information it can be possible to plan a successful project that is ready to work around certain problems effectively and to avoid failure. It is a good idea and excellent practice to work through the SWOT Analysis with your team in the early stages of project planning. Brainstorming is a great way of introducing all the relevant internal and external factors for each section of the analysis. Political – Laws, global issues, legislation and regulations which may have an effect on your business either immediately or in the future. Economic – Taxes, interest rates, inflation, the stock markets and consumer confidence all need to be taken into account. Social – The changes in lifestyle and buying trends, media, major events, ethics, advertising and publicity factors. Technological – Innovations, access to technology, licensing and patents, manufacturing, research funding, global communications. Legal – Legislation which has been proposed and may come into effect and any passed legislations. Environmental – Environmental issues either locally or globally and their social and political factors. Unlike SWOT this strategy is more directly aimed at the external macro environmental factors that might be affecting the position of your business, the reasons behind growth or decline in the market and also identify new directions for the business as a whole. Creately has some excellent PEST analysis templates for you to get started instantly. Directly comparing SWOT vs PEST is probably the wrong thing to do. They are both planning methods that give tremendous insights for you to successfully execute projects. The disadvantage of PESTLE analysis is it doesn’t consider the internal factors of your organization. It deeply analyzed the external factors that might affect your project or organization. So if you plan your projects based only on the PEST analysis you will not have a chance to match your strengths to a current need. SWOT analysis considers both the internal and external factors. It captures the external factors in the opportunities and threats section. 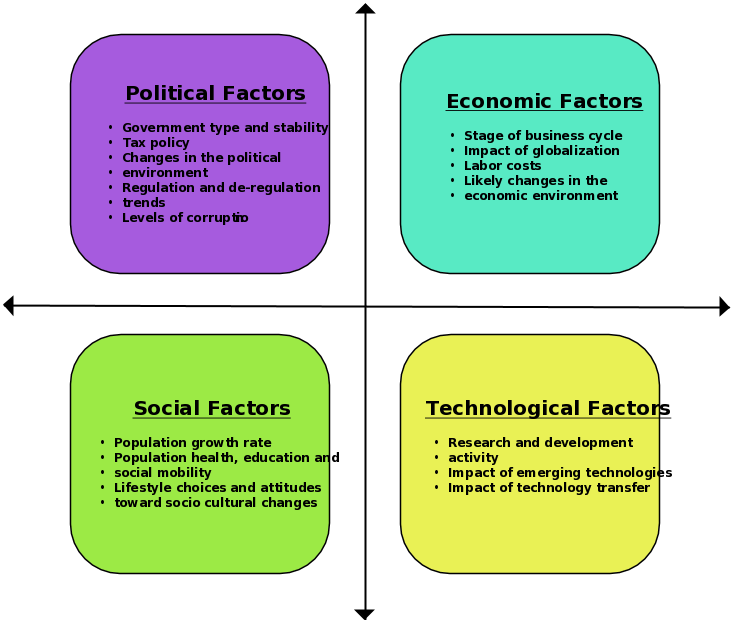 However, when creating a SWOT diagram a deep analysis of external factors are not performed. At least not as extensively as a PEST analysis. So you might miss out on external factors that can benefit your project. So a better approach would be to perform an extensive PEST analysis and use that finding in the opportunities and threats section in the SWOT analysis. When teams are not in the same building it can be difficult to get together and brainstorm effectively about a project. This could lead to vital information getting neglected, thus damaging the project. You can easily avoid this issue by using the collaboration facilities provided by Creately. The project manager can start drawing the SWOT and PEST analysis and invite another team member to contribute to the diagram. This makes it easier for all relevant departments and team members to contribute. It reduces the possibility of important information being missed. The results which have been recorded on your Creately SWOT template can then be used to plan a project carefully and overcoming problems which could cause significant issues to the positive outcome of the project. Being prepared for all eventualities is vital in business, which is why SWOT and PEST analysis is so important. Remember it is never enough to simply have the information to hand, what is vital is the way that the analysis is used in order to boost profits, make sure a project is successful and to identify areas of opportunity which could transform the business for the better. In the view of SWOT and PEST analysis, will SCOPE planning be a better choice. While SWOT focus on the internal factors and PEST focusing on the external factors, does that means that a SCOPE planning will be able to provide an overall insight of an issues or situation ? I am new to this and actually quite confused on which kind of analysis that I should use for my business. How would one use the SWOT or PEST analysis for organizations or associations that have no competitors or that are leading world organizations? For example a small organization that operates on an worldwide level and is the sole representation for a specific industry? What kind of analysis can be conducted for this type of organization? Or are there always competitors no matter what the situation? To me SWOT has always worked better. but also trying something else is no harm. Thank you for exploration. Post the latest version of SWOT. Big thanks!! Thanks for this comparison, did not know about the PEST. Reading your post, it’s another strategic tool, but let’s keep in mind these are far from real consulting use today, at McKinsey no one uses SWOT in real life. I like to the graphics – makes it a bit more clear. I am truely amazed by the explanation provided in the article.I work for a utility sector andi have been named as a team member to prepare the invitation for SOWT and PESTLE analysis. I am clueless and would like to know from were do i need to start and any references or guidance you could provide me. You can use the images, please do mention us in the credits. I am a doctoral student writing my dissertation entitled “A PHENOMENOLOGICAL STUDY OF LEADERSHIP TOOLS FOR ENVIRONMENTAL SUSTAINABILITY”. Presently I am preparing my proposal for approval from the IRB. Within the content I have used your figure 2 (p.239) from your 2011 article “SWOT analysis vs PEST analysis and when to use them”. Would you grant permission to use this figure in my dissertation? I would be most grateful. I think SWOT/PEST strategy is not only best for projects but also in business. If someone apply this strategy in business, I am sure they will never face any failure in their lifetime…Very well elaborated post on this topic, i must say.. No one will get this information on any other blog or forum.. Easily the best graphical analysis of SWAT and PEST that I have read in the last few years. For anything to do with the understanding of SWAT or PEST this will be my reference guide. Thank you for this. To me , the conventional SWOT AND PESTAL analysis still captives me more than any other because of its wide range and robust factors subsumed as internal and external determinants of a project or marketing plan. @Karl, looks like another excellent analysis tool. Thanks for sharing the diagram. Another good analysis tool is B/P/T Analysis. It is much more focused on the internal product strategy and abilities of the organization vs PESTs on external factors.